At Mercian Archaeological Services; as a Community Interest Company set up to undertake Community Archaeology- the opinions of the community and volunteers who have worked with us are the most important thing to us, and we are very proud of our reputation for quality work. We are very proud of our place at the heart of the community we serve. 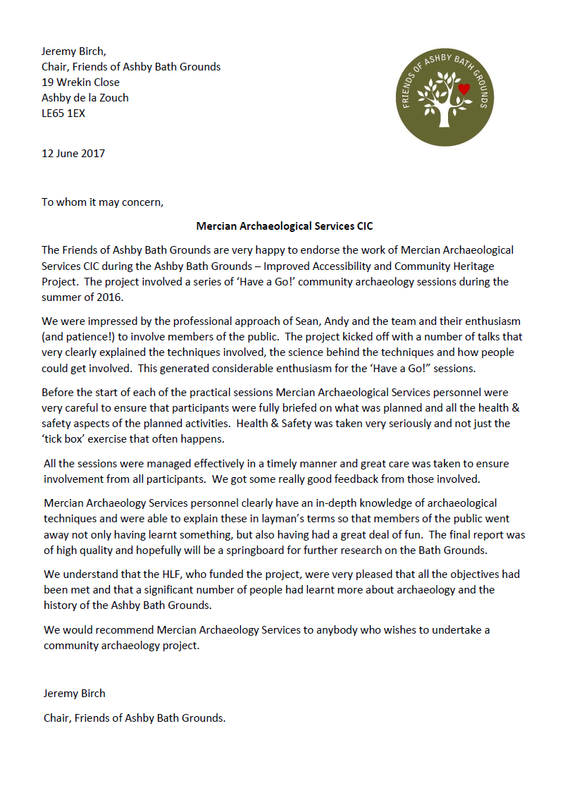 At Mercian we recommend that any group looking to work with a Community Archaeology provider asks for feedback from their previous customers. Community Archaeology is a skilled specialism that demands the highest commitment and standards. We believe that large commercial archaeology companies cannot necessarily provide the personal service you will receive from a dedicated community archaeology company. Please scroll down to read and and listen/watch some of the fabulous testimonials we have received from satisfied customers. "I have worked alongside them, their work is considered and professional and to the highest standards. At all times they share information and knowledge to volunteers and visitors. Their encouragement has helped us achieve so much not only on this project but also with other groups in the area." - Mickie Bradley site owner King John's Palace, Sherwood Forest. "We thought the teaching was very good, both informally and via the lunchtime talks and handouts. The handouts were especially appreciated. You were patient, encouraging and prepared to answer questions both in general terms and in detail. Our members especially appreciated the fact that you did not talk down to them." - Ticknall Archaeological Research Group committee. "Mercian are some of the most trustworthy, reliable, hardworking and honest people I've worked alongside" - Mike Currie, Volunteer Archaeologist. "Andy's knowledge and understanding of Sherwood Forest and its surrounding area cannot be equalled. He is essential to so many projects." - Mickie Bradley site owner King John's Palace, Sherwood Forest. "I thought they were excellent – well qualified, experienced, thorough, well equipped and prepared, patient and very good at talking things through – their mini lunchtime “lectures” were enjoyable and instructive and – they were good fun! A template for the most part of how things should be done and would recommend and rate them highly. I benefited hugely." "I felt that the archaeologists were clear in all that they did and said and helpful in all aspects of the work. I only had to ask a question and they were there instantly with helpful information and advice. They were very encouraging and didn’t treat me like a complete amateur; they were patient and able to simplify more complicated explanations! They also realised that they were with a group of older enthusiasts and did a lot of the heavy work themselves! They were very pleasant and approachable young men." "I learned a great deal from the experience and particularly enjoyed drawing the profiles of sections of the dig. I thoroughly enjoyed the time I was able to spend on the dig and look forward to the next outdoor season." "I would certainly recommend Mercian to other groups. They were immediately just part of the TARG Team, a very useful and knowledgeable part, explaining measuring, stratigraphy, photography and drawing in terms understandable to amateurs such as ourselves. As well as these specific disciplines there was also a great sense of exchanging information and experiences." "Mercian Archaeological Services were very friendly and stood back so all us members could have a dig, instead of taking over the dig. Once again I thank you for a super time." "Although I was there for only a short time, they made you feel part of the team straight away and were interested in your thoughts and ideas and willing to show you how best to proceed. Their small lectures were adequate and uncomplicated. I would recommend Mercian Archaeology to other groups as they seemed to know their stuff and recorded all aspects. Overall the dig was professional, relaxed and very enjoyable." 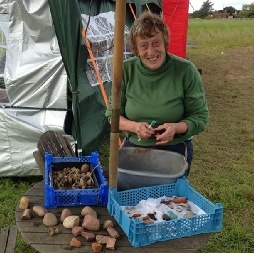 "...would have no hesitation in recommending them for similar activity in running/supervising any other group of volunteer amateurs"
"Firstly we all thoroughly enjoyed the dig. I have nothing but praise for the archaeologists on the dig. They were helpful, informative and friendly and each took a lot of time to involve the girls and explain about how a dig is organised and the techniques that were used. The lunchtime lectures were a definite added bonus giving us some theory behind the practical work. I would certainly recommend Mercian Archaeology to any other amateur group, particularly a group containing children, as at no point did they talk over their heads or make them feel uninvolved or intimidated. It was a fabulous experience for us all." - A volunteer archaeologist. “I would just like to thank everyone involved in the Peel and Spa Ponds presentation to our group (Forest Town Nature Conservation Group) yesterday evening. A totally captivating, exciting and informative presentation, many thanks - I know we are all excited about what we may discover around the next corner” - Richard, Forest Town Nature Conservation Group. “Mercian really do meet our exacting standards and our ethical outlook”. 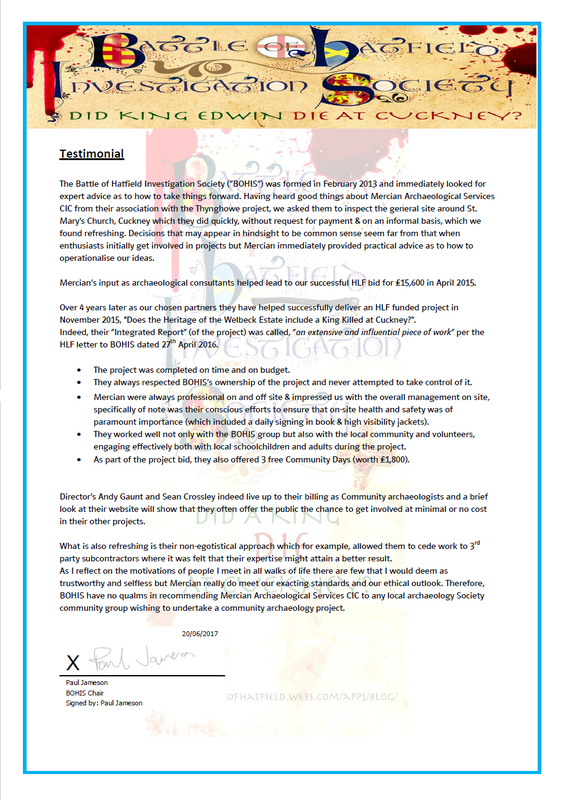 “Therefore, BOHIS have no qualms in recommending Mercian Archaeological Services CIC to any local archaeology Society community group wishing to undertake a community archaeology project”. “The project was completed on time and on budget”. Friends of Ashby bath Grounds, Ashby-de-laZouch, Leicestershire. “We understand that the HLF, who funded the project, were very please that all the objectives had been met and that a significant number of people had learnt more about archaeology and the history of the Ashby Bath Grounds”. 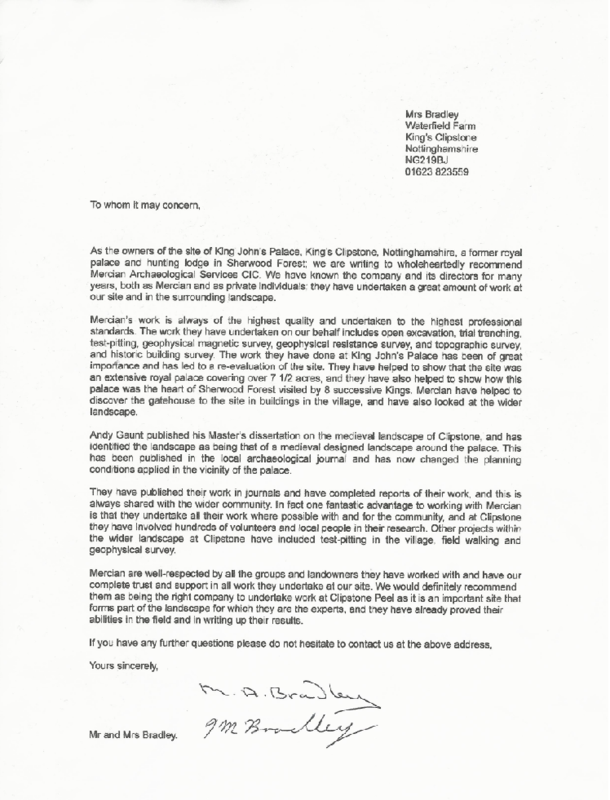 “We would recommend Mercian Archaeology Services to anybody who wishes to undertake a community archaeology project”. 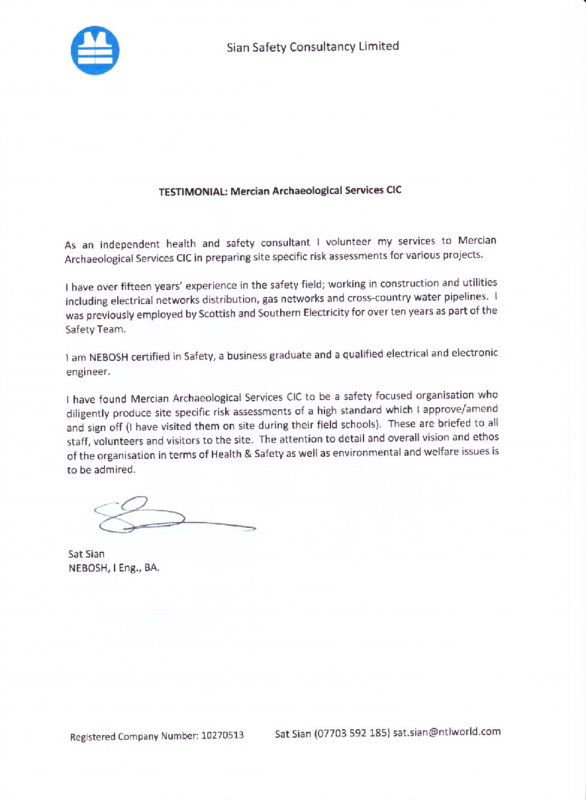 “I Have found Mercian Archaeological Services CIC to be a safety focused organisation who diligently produce site specific risk assessments of a high standard which I appreove/ammend and sign off. These are briefed to all staff, volunteers and visitors to site. “In conjunction with Mercian Archaeological Services CIC we trained a significant group of volunteers to undertake a week's archaeological investigation. Our relationship with the three archaeologists Andy Gaunt, Sean Crossley and David Budge from Mercian has been crucial - and somewhat unique. They have worked with us for years and a profound trust has developed between them and the Friends of Thynghowe. As a community group working on this site we have developed our own expertise and insight and a certain level of ownership. 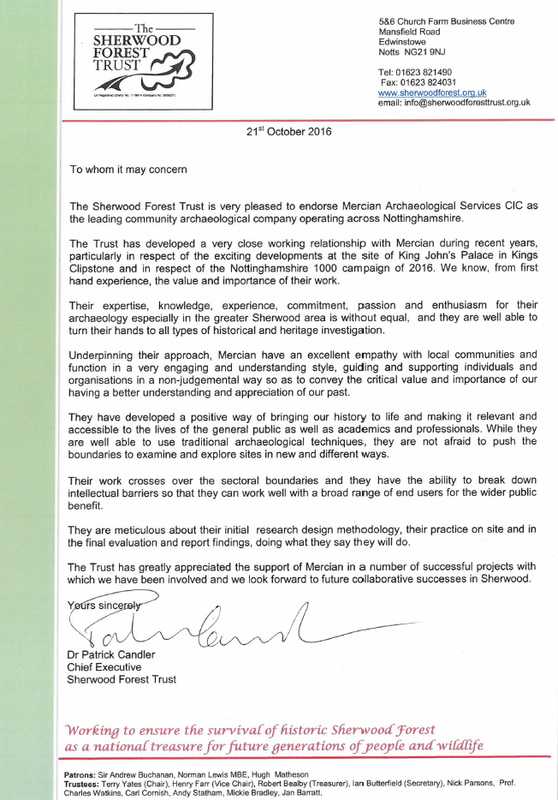 The Mercian guys have been acutely sensitive to that and have shown us - through their work with us and other community archaeology projects in the Sherwood Forest area - that they do not 'take over'. They consult at every level and deliver a high level of training with an awareness as to what can be achieved. They are highly professional in every aspect of their work but also like us have a passion for the site.